The Ancient Harmonious Society of Woodshedders (AHSOW) was formed in 1977 with the purpose to preserve the skill of woodshedding as an art form within The Barbershop Harmony Society. Woodshedding is three individual voices (tenor, bari, and bass) creating barbershop harmonies by ear to a Lead's melody, without any written arrangement. The melody is introduced by the lead so all can become familiar with it, but should not have a well-known arrangement This art hearkens back to over a century ago, to the origins of barbershop quartet singing, where four men would gather (frequently at the local barber shop) and harmonize to the familiar tunes of the day. 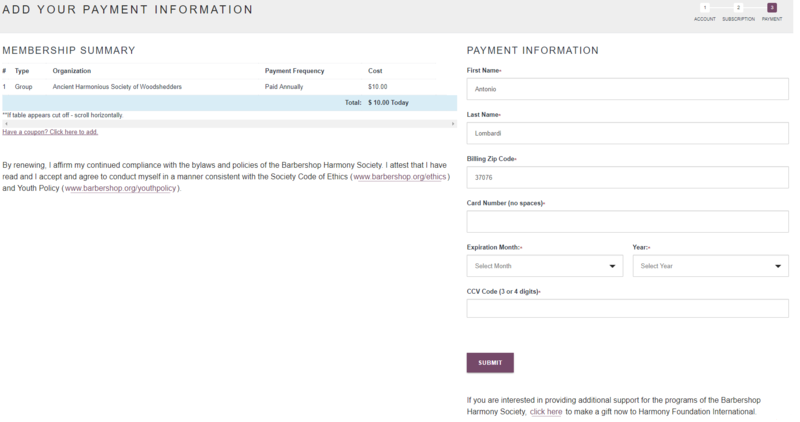 Renew your AHSOW Subscription with the Barbershop Harmony Society as either a member or associate through our Member Center. Coordinate payment with a friend, family member, fellow chapter member, quartet member or chapter secretary. You pay them, they pay on your behalf using any of the above methods (no fee). **Allow extra time for processing. $10 fee recoups high check-processing costs. Use your username (email address on file with BHS) and password. If you forget your password, visit here to be emailed a temporary password: https://members.barbershop.org/members/forgot_password. If you have forgotten or you do not know your username, contact the BHS Customer Service Team at customerservice@barbershop.org or 800.876.SING. If you would like to remove a subscription contact the BHS Customer Service Team at customerservice@barbershop.org or 800.876.7464 BEFORE entering/submitting your credit card information. What if I am not currently a member of AHSOW but would like to join? Do I need to be a Member or Associate of BHS in order to renew my subscription with AHSOW? No - only to renew your AHSOW subscription using the Member Center. Affiliates and those who are not currently members or associates of the Barbershop Harmony Society must renew their subscription with AHSOW directly through their website here: http://www.ahsow.org/membership.shtml. If I am not current as a BHS Member or Associate of BHS but am interested in continuing in AHSOW, how do I do that? For assistance, contact our Customer Service Team at 800-876-SING (7464) or customerservice@barbershop.org.